Update: 2 Lucky Winners!! #65 & #69..... CJ and SewTakeAHike. Let Corrie know your choice. She's out of town until ...........hmmmm....I don't know. But she'll get it out to you first part of next week. maybe. :) Congrats, Winners and for the rest of us....there's always next Thursday! Quilt Sampler comes out twice a year and features 10 top quilting stores throughout the United States. You'll see photos from each store. Taking a trip without ever leaving your couch. Canada is even represented in this issue!! Stores from Phoenix to New York. Each store also provides a project. This is always such a popular issue for all the great decorating ideas alone! This quarterly magazine is just as it states....Quilt and More. Projects~quick and easy, Quilts~challenging and interesting, and always.....pillows, totes and tablerunners. This issue has a fun article on quilting ideas with panels. We're giving away TWO magazines, Two Winners! And it just might be your lucky night. We are having very nerdy technical issues between blogger and internet explorer. Many regular and new commenters are having a hard time getting through to the blog. I finally switched over to Firefox and FINALLY, no problems. But hopefully, blogger will have this bug worked out soon. But the odds are on your side tonight. Leave me any kind of comment you wish. No hoops to jump through?? Don't get use to it. Random Drawing later tonight, Thursday. Good Luck and thanks so much for hanging out with us! hey Taffy Jane. Waiting for my gorgeous fabric to arrive and would absolutely love to have these magazines for inspiration. much like you I didn't win anything from SewMamaSew. I love Firefox, on bugs on my computer! (except maybe the dust bug). Would love mags, find American mags hard to get in Australia, plus need some inspiration to use up some of my stash so I do feel so bad for buying more. Oooh I didn't win anything over there either! Love all of these magazines :) I've had terrible blogger problems lately, good to know it's not just me! Computer problems are SOOO frustrating! These look like GREAT magazines! Have a WONDERFUL day! I also didn't win anything, but there's still the SEWN giveaways running through June 8! Thanks for the chance at your giveaway. Not that I need anything else in my to-do pile, but I love getting a new project idea from fun, pretty, colorful magazines! Fun! I would love to win one of these magazines! Yay for another great giveaway! I didn't win a single either...and I entered plenty! I would love that Quilts and More magazine. That looks like a lot of fun! Y'all are SO good about having a lot of giveaways! I LOVE it! Thanks for making your blog work for me again, It has been so frustrating not being able to access some of my favorites. Technology is wonderful but it can be a real pain. I'd like to have quilts&more... because i already got the other 2... one in the mail and one at the market!! i love quilty mags! I love magazines...I mean LOVE! And I currently don't own any of those new quilty ones. Would love to. thanks for the giveaway! i love quilting magazines! American Patchwork & Quilting sounds like a great one! I am new to quilting and I need all the tips and tricks that I can get! Thank you for the chance for the great giveaway. The internet can be frustrating at times, can't it? I switched to Firefox a few months ago after having major problems with IE. I love it and haven't had a single problems since! I most always buy the Quilts and More magazine...there are always great patterns in it! Boo Hoo, I didn't win anything either. My summer goal is to use up some stash, so I'd love to win these new magazines for some fresh inspiration! Always looking for more inspiration. Thanks for the info! I did not win either. These magazines would keep me busy all summer. My children will as well though! Thanks as always for the giveaways and I enjoy jumping through the hoops. I didn't win either :-( I have been a subscriber to American Patchwork and Quilting for years (and my sub goes to 2011) but I also love their other publications. Quilts and More has a lot of great ideas too. Love all of these mags but Quilts and More is my absolute favorite. I always find something to make. I didn't win either...but I'd love a magazine to play with my ever growing fabric stash! Neither did I win any. I would love the Quilts & More Summer 2009 magazine if I am picked. I didn't win anything either. I would love to get some inspiration on a quilt for me. I can't decide on a pattern. There seems to be a lot of us that didn't win a blessed thing from Sew Mama Sew. Bummer. I love the magazines thopugh, help direct what to do with all the stash!! Thanks so much! Great magazines and I would love to win one (or two) for some inspiration for my next quilt. Thank you! What a great give-away! I didn't win anything from SMS either, but I'd love a magazine to keep me inspired. Thanks! I enjoyed looking over your blog. Thanks for sharing your talents. Well then I guess it's my lucky day for checking in here today!! I LOVE a good magazine!! Thanks! Well I certainly didn't win anything. You know I was on a roll there for a while but I've hit a huge dry spell. Bout time it changed!!!! These are my favorite magazines. I've had problems lately with opening blogs and having them open new pages like a pop-up and never stop! oy thats bad. Random comment...I think another day of rain is in store for us today. I don't mind. Have a good day! I didn't win anything at Sew Mama Sew either... oh well. I would still love these great magazines though! I didn't win either!! Thanks for the after party! I hope beginner's luck will win me the magazines! I'd love to have some more summer reading! Perfect for those beach days! I'm going on a quilt shop tour this weekend and will need some things to read on what to do with all the fabric I will get! Thanks! Thanks for the second chance! My kids keep telling me to use Firefox. Change is tough for an old lady like me! I love all things magazine! I already subscribe to AP&Q, but not the other two - I love looking at magazines while relaxing in a bubble bath! Quilt Sampler for me please! Im still licking my wounds from winning NOTHING with sew mama sew too! and my heart was set on a gc to your place!! You know I want, want, want....I would love a new magazine for inspiration! Well, I was a big loser, too, in the giveaway. Although, maybe I was a winner because I found all these great new blogs! Please enter me into your magazine drawing. I'm new to quilting, and I'd love any advice! Thanks! I too was not lucky in the SewMamaSew giveaway. 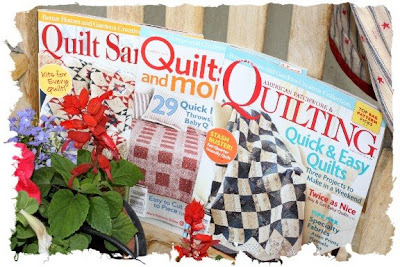 Would love to win the Quilt Sampler magazine. I too have had not so nice blogger problems. I am going peruse your blog and see what others are suggesting! I would love a magazine. I have a car trip coming up and a magazine would be great to read along the way. yeah! I did not get kicked off your site today! Yahoo!! hope you have a nice weekend! i love the way you write. its so funny! you have a good tallent in that 2! thanks for the give away! i realy wish to win this one! I didn't win any of the giveaways, but went to some estate sales this last weekend and won big time there! Thanks for the great giveaway! Oh, and the American Patchwork mag sounds fab to me! I didn't win anything either. Wonder who did?? Would love one of the magazines. I didn't win either...but I didn't enter many either. I promised myself I wouldn't get swept away in all the bloglands out there. LOL. You are too funny! I didn't win either but am grateful for the generosity of all the bloggers. Thanks for the inspiration and the laughs! Cant' get enough of that magazine inspiration! I am about to start my summer vacation and I would love a new magazine to flip through! Bring on the inspiration. Quilt magazines is always so inspiring. If I am bored some day I always have my magazines too read,these would be so great to win.. I'm very new to quilting. These magazines will be a god send, if I win ! OH pick me. I need some inspiration. And thank you for the sweet comment about my grandpa and momma's cooking. I am one of the lucky ones!! As are your cute kids. Oh wow! A giveaway and I can say whatever I want. Let me see you should pick me because I just spent the day taking 33 kindergarten kids on a field trip and I definitely need to just sit around with my feet up for a while! Thanks for the magazines. Oh how fun. I'm one of the new followers here. Maybe I'll be lucky. 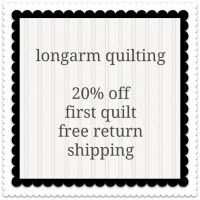 Given that I am just starting to learn how to quilt I would love to win. I haven't heard of any of those magazines before but the Quilts & More looks very interesting. I'm hoping to make quilted table runners for Christmas presents. at least you can know you were not the only one to lose every giveaway from SMS. oh well! crossing my fingers on this one! Oh the time we'll never get back. Comments after comments and no win...sigh.. Just kidding. It's a good thing I didn't expect to win. I did enjoy getting to see so many great blogs... and such inspiration!!! I didn't win either. Oh well maybe I can win here? 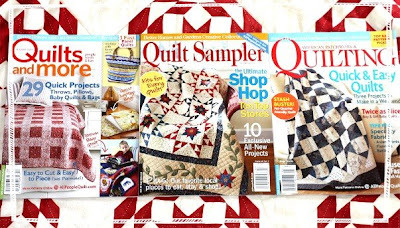 I already have the Quilt Sampler magazine but would love the Quilt Sampler. Thanks for the giveaway. Looking through magazines is the best hobby besides sewing whats inside of them. Great giveaway. Thank you, Thank you! WOOO HOOO! Yay! Thank you so much! !